Only a few days left...what do you want your students to learn about? The end of the school year is drawing near and I want to make sure that I send my students off with some "middle school vocabulary." No, not what you're thinking. I'm thinking a plethora of science and math terms to impress their new teachers and peers with! There are several ways that I enjoy reviewing concepts and terms in my classroom, but two of my favorite are the Name Tag Game and a Vocabulary Parade. Neither of these review techniques are limited to a certain subject or really a certain age. With the Name Tag Game I write a vocabulary term from the unit that we're studying, or since it's the end of the year it might be something we first learned about at the beginning of the year. I then simply peel the name tags off and smack (not really!) them on the students' foreheads. The whole point is that they can't see them. When I tell them to "mingle," they walk around the room and start soliciting help from their classmates. It's a throwback to the game show $25,000 Pyramid. Their classmates start giving them clues, definitions, and/or examples to help them figure out what word is perched on their head. Once they've figured it out, they return to their seats. To give it a little more depth, we then go around the room and have each child say their word and it's definition. We had tons of laughs when we did this recently and one of my students wore their name tag for the rest of the day that read, "Hello my name is bladder." The kids love it, and it's no where near as dreadful as copying definitions out of a glossary! Another annual tradition in our classroom is a Vocabulary Parade. Students are able to pick a word that they've learned throughout the school year, design a costume, and become a vocabulary expert. This year we stuck to a science theme, but in the past we've done a variety. After choosing a vocabulary word students must become experts on the word's definition, part of speech, and how to use it in a sentence. We parade through classrooms, the principal's office, and the hallways sharing our love of rich vocabulary. This would be a fabulous way to highlight great words found in a novel your class is reading, math terms, and even for preschoolers learning fun new words. 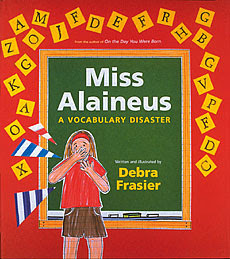 Our inspiration for our yearly tradition is this cleverly written and illustrated book Miss Alaineus by Debra Fraser. Not only is it funny, but it is chock full of what else...vocabulary!